It’s day four of the SIUC strike. A federal mediator has been asked to come in to facilitate negotiations and will hopefully arrive today. Until then, the students of SIU deserve better. Chancellor Rita Cheng reports that only 5% of the students at SIU are being adversely effected by the strike. Hmmm… that equals out to 1,001 students. I surely would hope if I were in that group she would value my education. Dr. Suzanne Daughton’s sign says it all. 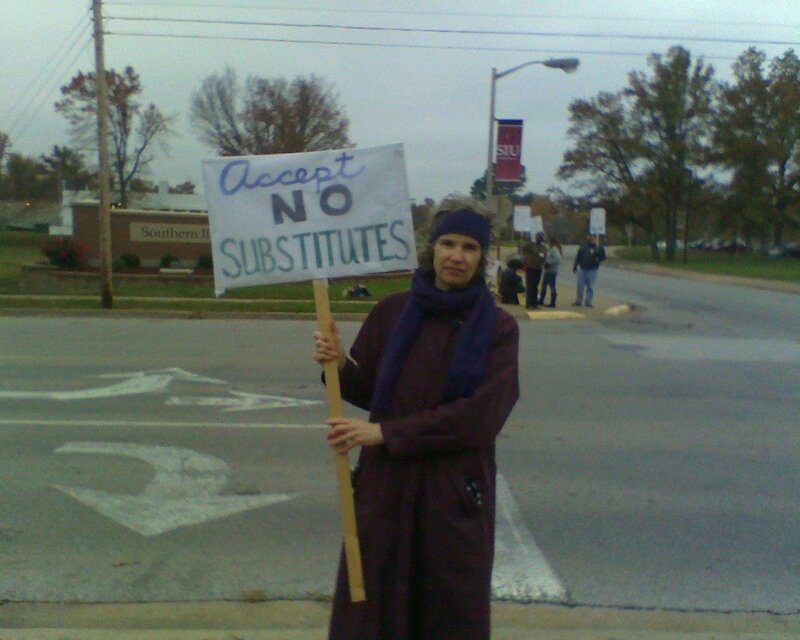 SIUC students need their actual professors, not substitute teachers. I cannot imagine the debacle SPCM 510– Rhetorical Theory would’ve been if I hadn’t had the wise and gracious instruction of Dr. Daughton. This entry was posted in Photo of the Week and tagged Higher Education, SIUC, Unions. Bookmark the permalink.